The holiday season is upon us. Many people will be going to parties this month, socializing with friends and partaking of rich dinners, hot hors d'œuvres, and luscious desserts. And many people will not. There are (at least) 35-40 people in the Hadley area who may not be invited to share a Christmas ham and a pumpkin pie and who may not even be able to cook for themselves. These homebound seniors receive Meals-on-Wheels during the week, but unfortunately not during weekends or holidays. The Take & Eat Weekend Meals Ministry has stepped in to ensure these people are not forgotten. 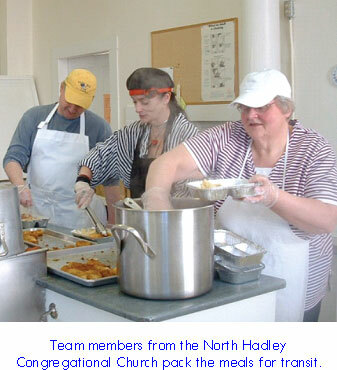 Once a month, 15-20 volunteers from First Congregational Church of Hadley and North Hadley Congregational Church gather at First Church to prepare, cook, package, and deliver 35-40 meals to Hadley’s homebound seniors. “Rain or shine, in sickness or in health, I’m proud to say we pull together month after month to bring a wonderful home-cooked meal to our homebound seniors, as the congregation promised!” said Lisa Jacque, the Ministry’s coordinator. During the month before serving, seven coordinators work to plan a menu, request and pick up food donations, shop, and call volunteers to bake, drive, or help in the kitchen. The groceries are purchased with sales in mind, fresh produce is gathered from local farmers and farm share donations, and whenever possible from local stores. One of the coordinators secured a generous monetary donation from a local club. On the scheduled day, kitchen help and cooks arrive early in the morning to begin food preparations. One of the members took the Safe-Serv certification course to satisfy requirements for operation. This is no ‘brown bag’ meal dropped off at the door. One of the more recent menus included ‘tender breaded pork cutlets, cabbage, roasted potatoes, homemade applesauce, a fresh tossed salad, rolls, butter, and a fresh apple.’ One member showed up with mini-pumpkin whoopee pies to add as dessert; another stopped in to contribute some chocolate goodies. In addition, the meal is delivered with a warm smile and a conversation.